Doing a call-in show about divorce? Want more unique perspectives? Hear from youth and adults, gay and straight couples, and more. Below are picks chosen by PRX editorial staff. You can see more pieces about divorce by using our search. 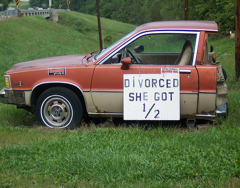 What's the impact of a divorce? Award-winning producer Sasha Aslanian and thousands of other kids know. Aslanian explores the "divorce revolution" of the 1970s from the perspective of kids who lived through it, and experts who have had three decades to make sense of it. "Divorced Kid" also examines how the experience of divorce has changed for kids since the '70s, through kids' classes and judicial reforms designed to improve the outcomes of divorce. The program debuted on Minnesota Public Radio and received a torrent of positive listener calls and comments from those who wanted to contribute their own stories. Award-winning former American RadioWorks’ producer Sasha Aslanian explores the "divorce revolution" of the 1970s through the perspective of kids--like herself--who lived through it, and experts who have had three decades to make sense of it. Using a lively blend of first-person storytelling, (surprising scenes like playing the reel-to-reel audio of her own parents' wedding vows back to them), interviews with Avery Corman, the author of Kramer vs. Kramer, and revisiting the now-grown kids who wrote "The Kids Book of Divorce" in Cambridge, Massachusetts in 1979, the first half of the documentary reports on the lessons learned from the 1970s. The second half of the program examines how the experience of divorce has changed for kids since the 70s. We hear the voices of 4th and 5th graders in a court-mandated class for kids in Minneapolis as they learn how to avoid “divorce traps” kids can fall into. Aslanian follows one of the kids in the class, 10-year-old Lizzy, as she gets a new stepmom, half-brother and stepbrother, and enters adolescence. The program also features judicial reforms to improve divorce. Note: Promos need tags. :23 + :06 music tails. In a time when gay folks are splattered across the media over the legitimacy of gay marriage, Outright Radio offers a little respite from the hype with a show on gay divorce. The eX Files ? stories of gay divorce. In a time when gay folks are splattered across the media over the legitimacy of gay marriage, we offer a little respite from the hype with a show on gay divorce. Jenny Worley and Renee Rivera find a harmony in a post-nuptial lesbian utopia. Kim Ficera swears she isn't bitter when she spies her ex in the grocery store with her new babe. And finally, David Gilmore tells the story of his relationship with Patrick ? 3 years together and a decade of processing after the split. The recession has certainly changed the way many of us live our daily lives: second-guessing that impulse purchase at the mall, perhaps opting for the cheaper vacation near home rather than the exotic trip abroad. But it's also shifting the way some people handle major life events, including divorce. Jeremiah, whose parents have been divorced for 11 years, says it has been an ongoing struggle for him. He wanted to know what it was like for other kids, so he walked around Montpelier and talked with kids about divorce. Here's what they said. Divorce and tornadoes. If possible, deal with them both in the same day. Sealed explores divorce and its lingering effects. Nearly two decades after their parents’ separation, four siblings reflect on its aftermath. This 22-minute piece explores divorce and its lingering effects. It is the same story told through four different voices and perspectives: my own and that of my three older siblings (David, Crys, and Derek). They all stayed with Dad, experiencing a fairly quick re-marriage and relocation in the midst of their high school years. I alone moved with Mom. Psychological research shows that there are a number of long-term effects that children of divorced parents experience, many of which are common across family circumstance. As such, the piece proves relatable and potentially cathartic for a wide-ranging listening audience. My primary content sources are long-form narrative interviews with each of my siblings, supplemented by audio from old cassette tapes and conversations with my parents. Audio-only work provides an intimacy especially suited for this topic as listeners can internalize whatever image best suits their own schema—allowing for deeper connection and identification.